Marilyn SanClemente April 14, 2016 April 14, 2016 All Occasion Card, Birthday, Chalkboard Technique, New catalog, Stampin' Up! I am so excited to be at OnStage in Salt Lake City for the release of the new Stampin’ Up! catalog for the 2016 to 2017 year!! All I have to say is OMG! I love love love so many of the new products that are coming out! I will be placing my pre-order and able to share some of these great new products with you over the next few weeks! One of the pesky issues with the Big Shot has been fixed! Stay tuned! 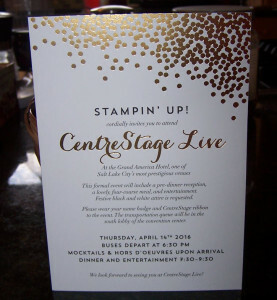 Tonight is the Centre Stage Live event! I am going with my friend Barbara Lash and looking forward to a fun night. Thank you to my team – both Stamping New England and the NEStampINKers and all of my Customers for allowing me to promote to Silver Elite and attend this fantastic event!! And of course, what is convention without swaps? Here is one of the swaps that I made to share with others. This card uses the Watermelon Wonder Cardstock and inks with the Softly falling embossing folder. 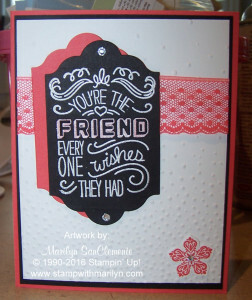 The sentiment is from the Friendly Wishes stamp set and is stamped with white ink and embossed on Black cardstock to give the card the Chalkboard look. I used a piece of Watermelon Wonder Lace to add a shabby chic look and one of the flowers from the Petite Petals stamp set. I can’t wait to share more with you over the next couple of days!! Stampin' Up! new catalog. Bookmark.